A couple of gentleman Stuart Foley and Samuel Cawkings have begun a fantastic series on Star Trek ships dedicated to bring little known facts, trivia and speculations on their design, appearances and creation. This particular episode is a special interview with one of the designers of the Enterprise NCC-1701 Refit from The Motion Picture Movie and the Enterprise D from Star Trek the Next Generation. He and Mike Okuda are literally the designers of the 24 century look. I'm a huge Sci Fi fan of Mr. Probert's work and his concepts in-body just about everything I do as an artist. This Interview is likely to have several parts. Since this is Sci Fi Meshes I thought others would enjoy this series as much as I do. I initially thought this was just another pet project but besides the interview with Axanar producers I found it's base content to be very good on par with Memory Alpha. Take a peak if you like Starship Design as much as I do. 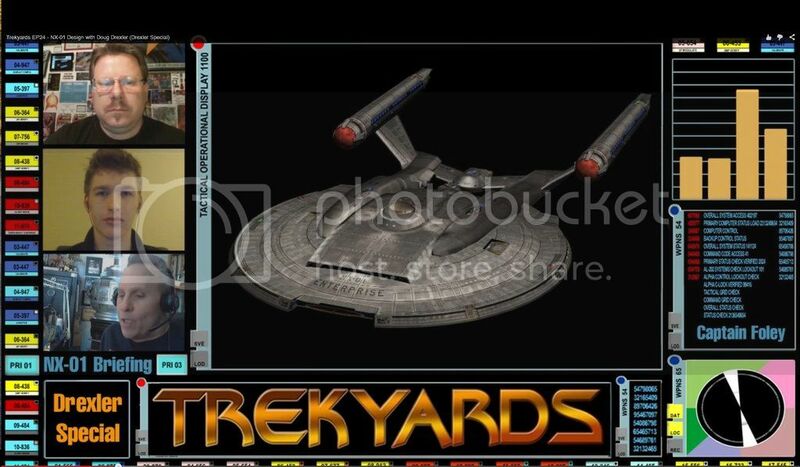 Captain Foley and Commander Cawkings Introduce Tobias Richter promising more insight into the highly publicized Fan Projects like Star Trek Phase II and The Battle of Axanar. Tobias has a strong presence here on Sci Fi Meshes. Occasionally giving us a peak into his project progress and processes. Tobias makes mention of a few "tweaks" to some of the JJ ships. I never noticed. I will have to go back and watch again with a sharper focus but I concur with Foley, in thanking Tobias for a moderate hand in reproducing Ryan Churches' designs from Star Trek 2009. I am always spell bound by Tobias's fast and detailed work. I know of few who can match his skill with a polygon and look forward to (I hope) giving us a chance to see how he does it. I do enjoy the videos. I hope some will eventually be longer. Thanks! The whole episodes go for 30-50 minutes I think - this was just an introduction. I think the first one with me, about the D6, should be out today. I've always have been very critical of one John Eaves Design. The Enterprise-E. I'm dying know what happened with this ship. It got so close but was never what it was supposed to be. The Sovereign Class has lots of fans but I'm reluctantly not one of them. 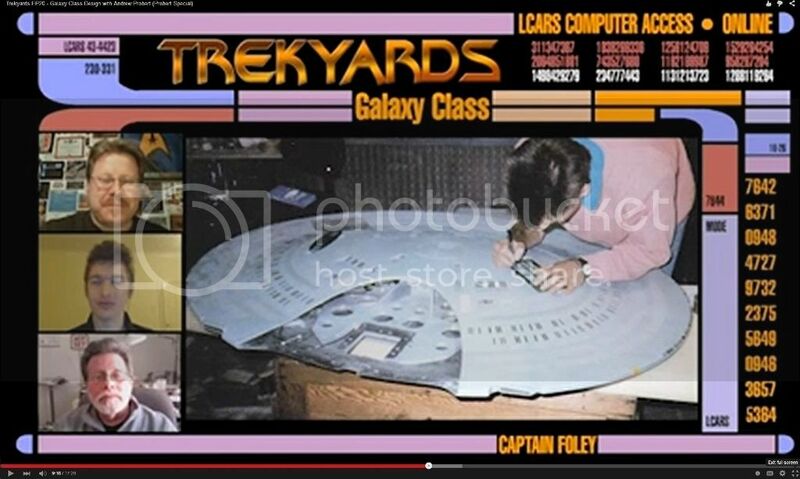 During the Trek Yards run I've at least found out that ILM might have been part of the problem. I remember Andrew Probert saying he had to hold ILM's feet to fire to get the Galaxy Class Starship Enterprise exactly like it was supposed to be and it is exactly that. Experience might have been on Mr. Probert's side. One of key complaints is the lack of a warp core ejection hatch even though John Eaves clearly has drawings with the procedure. Along with a huge lack of sensor coverage in the lateral and aft arc and lack of weapons that plague the earlier version and prompted the Nemesis refit ILM might be only part of the problem. Does Sovereign separate or doesn't it? If it does there is no impulse engines for the Battle Section. There is a clearly designed separation plane under the saucer and there are definitely drawing with the separation process from Mr. Eaves. I've found the Sovereign a Galaxy clone. It offers essentially all the same features with no particular upgrades. Galaxy offered the starship separation to get families out of the battle field. I feel if you going to repeat this use you'd upgrade the saucer with warp capability. Especially sing as Prometheus offers the such expansion in Multi Vector Assault Mode. I know criticizing a loved class and a designer's work is shaky territory but I'm dying to know. Captain Foley and Commander Samuel Cockings bring us new interview with Doug Drexler features a Trek Legend loved and hated across fandom. As it's created Doug Drexler pulls no punches, he's just about heard it all. He reveals the inside scoop on the NX-01. He's quite honest but defends his creation with perfect poise as every artist should. This is one of my most hated ships, but Drexler is one of the best and while this design (like every design is molded by the powers that be) it was quite the revelation that would could have gotten a design that was completely out of place in this time perio.d I'll let you watch it to find out if you don't know. This is a truely fantastic line of videos. Every artist here should tune in every week. There should be more revelation instore and while I don't normally advertise for the support of people I don't know personally I have to say the product Trek Yards is producing being to increase in professionalism with every video.